Expect further tightening of trust and safety policies on eBay in the wake of a French court ruling concerning counterfeit merchandise. In what has the makings of a landmark decision, a court in Reims, France, has ruled that eBay is directly responsible for the sale of bogus Hermes bags on its auction site, and ordered the e-commerce giant to pay 20,000 Euros, or approximately $30,000, in damages. The ruling, handed down Wednesday, stated that eBay "failed to act within [its] powers" to prevent counterfeiting activity within its online community, according to a news report, which stated the verdict was the first of its kind in France. In a statement issued following the ruling, eBay said: "eBay takes the issue of counterfeiting very seriously and we condemn it outright. Today's court ruling relates to past seller verification issues. The court acknowledged that eBay subsequently addressed these issues with its enhanced anti-counterfeiting measures through its VeRO initiative." The VeRO initiative aims to combat counterfeiting and intellectual property misuse, but members and individual manufacturers are generally left to police the site and report violations. A handful of similar cases are pending against eBay in five European countries, and at least one is under review in the U.S. How heavily the Hermes decision will factor in the direction of the remaining lawsuits depends largely on the locality of the individual cases, notes Aaron Kessler, senior research analyst with Piper Jaffray & Co. in East Palo Alto, CA. "The question is, who is the merchant of record, and how much is eBay responsible for verifying the authenticity of the items sold on its site," Kessler says. "Each country might have its own interpretation of that." The material impact of the court fines will barely register at eBay$30,000 is pocket change for the multibillion-dollar Internet goliath. However, eBay has plenty to fear in terms of the psychological effect on buyers. While it's probably close to impossible to completely eliminate illicit activity on such an online venue, the company can and should take steps to increase enforcement, Kessler says. "There is continuing concern for buyers on issues of trust and safety. If people don't trust what they're buying, that's a problem for eBay," he adds. "We have been seeing slower buying activity on eBay the last couple of years." The Hermes case dates back to 2006, when the luxury fashion design house sued eBay, claiming the Internet auction company allowed three Hermes knockoffs to be passed off as the real deal, and sold on its site for a total of 3,000 Euros. According to an Agence France-Presse report, lawyers for The Hermes Group asserted eBay is "an active player in the transaction because, not only does it offer a number of services to improve the sale, but when it does not work well enough or fast enough, they intervene with the client… They are perfectly informed of the transactions since they take a percentage cut." Several other European designer brands, including Louis Vuitton, Dior Couture and cosmetics company L'Oreal have separately sued eBay for doing too little to thwart counterfeit activity. 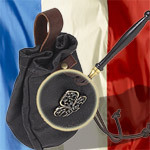 Unifab, a French industry lobby group, has also taken eBay to court, seeking action by eBay to better police its site. In the United States, a counterfeiting lawsuit filed by Tiffany in 2004 is now being considered by a New York federal judge. I don't see how ebay can be held responsible, they can't be expected to inspect every single item on every single auction to make sure its genuine and authentic. But it is up to them to take appropriate action when someone is found to be selling fakes.